President Trump held out hope of being "pleasantly surprised," but said he does not favor suspending arms sales to Riyadh over the situation. 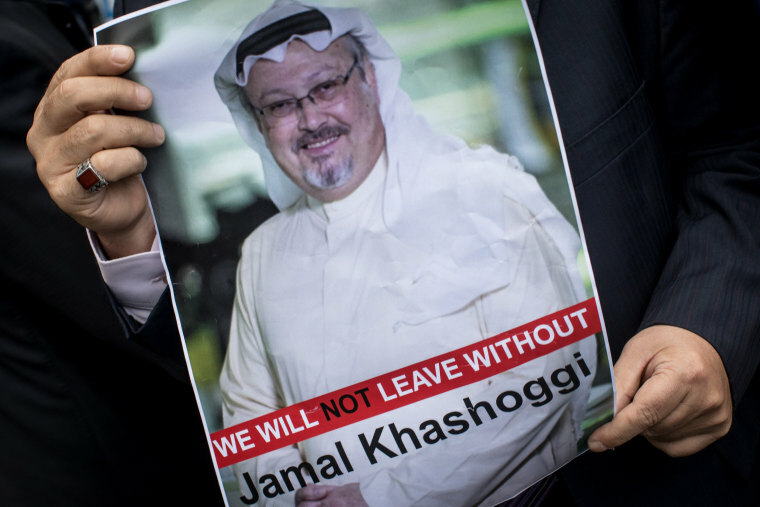 WASHINGTON — Lawmakers from both parties are publicly demanding that the U.S. government hold Saudi Arabia accountable for any role it played in the disappearance of Washington Post journalist Jamal Khashoggi, who was last seen entering a Saudi consulate in Turkey on Oct. 2. "My instincts say that there is no question that the Saudi government did this, and my instincts say that they murdered him," Senate Foreign Relations Committee Chairman Bob Corker, R-Tenn., told reporters at the Capitol on Thursday, adding that White House adviser Jared Kushner's close relationship with the Saudi government should not be an impediment to potential consequences. "I understand that there’s a lot of stock placed on that relationship, but if they’re murdering American citizens, then it doesn’t matter what our relationship has been," Corker said. At the White House, President Donald Trump continued to say that Khashoggi's disappearance was a "terrible thing," but that he does not favor suspending arms sales to Saudi Arabia as a form of retaliation. Democratic Rep. Gerry Connolly, a senior member of the House Foreign Affairs Committee who represents the northern Virginia district where Khashoggi lived, accused the Trump administration of fostering a "culture of impunity" with Saudi Crown Prince Mohammad bin Salman as he has gained power under his father, King Salman. "I want to be very clear: I would not lay this tragic development at the doorstep of Donald Trump, as if he had something to do with it," Connolly said — but added that the administration has "wittingly or unwittingly" led the Saudis to conclude there is "no constraint on them at all." "If the U.S. intelligence community had advance warning that an abduction or a kidnapping or illegal detention or worse was in fact being planned and plotted by the Saudi government, and that harm would clearly fall on Mr. Khashoggi, they had an obligation to inform him in advance," Connolly said in an interview with NBC News. The Washington Post reported Wednesday that the U.S. government received intelligence intercepts indicating that the crown prince had ordered lieutenants to lure Khashoggi from the United States, where he was a legal resident, to Saudi Arabia so that he could be detained. In an appearance on MSNBC’s “Andrea Mitchell Reports” Thursday afternoon, Corker declined to say whether he thought U.S. intelligence officials would have had an obligation to warn Khashoggi if they had information that the government was attempting to lure him to Saudi Arabia so that he could be detained. Khashoggi checked his cellphone just before entering the Saudi consulate in Istanbul last week, but did not read messages sent to him minutes later, according to screenshots obtained by NBC News. Corker said the Saudi ambassador to the U.S. had given him a “fishy response” when he asked the diplomat why there is no video surveillance of Khashoggi leaving the consulate in Turkey. Sen. Lindsey Graham, R-S.C., said Thursday that he had also had a disappointing conversation with the Saudi ambassador to the U.S., and that if the Saudis were involved in Khashoggi's disappearance it would be "a game-changer" in the relationship between the two countries. On Wednesday, he warned there would be "hell to pay" if the Saudi government were responsible.